(THIS WEEK ONLY!) 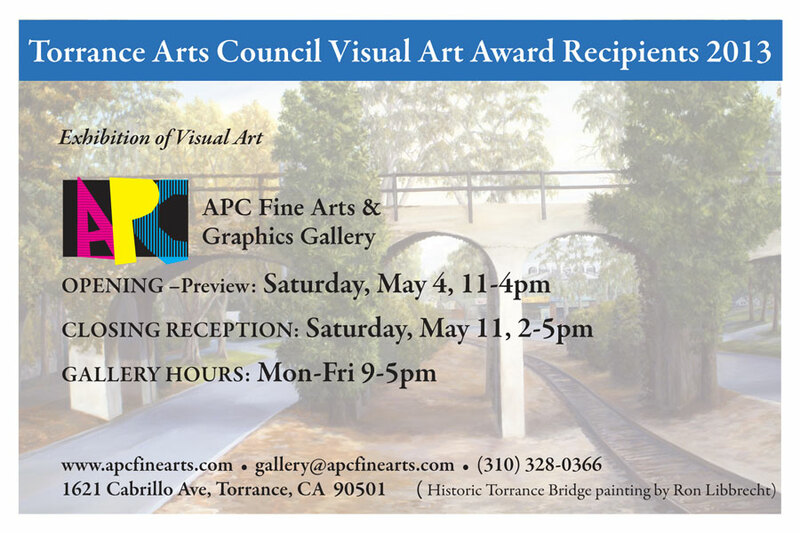 APC is hosting a gallery exhibition for this year’s winners of the Torrance Arts Council Visual Arts Award! Stop by this week during normal business hours (9am – 5pm), or come by the reception This Saturday from 2PM – 5PM for snacks, drinks, and a chance to meet and chat with the artists. THE ARTS COUNCIL OF TORRANCE ESTABLISHED THE ARTS RECOGNITION AWARDS PROGRAM IN 1993 TO ACKNOWLEDGE AND ENCOURAGE SERIOUS STUDENTS OF THE ARTS. THE SELECTION PROCESS INCLUDES A PERSONAL PRESENTATION MADE BY EACH OF THE NOMINEES ALONG WITH AN INFORMAL INTERVIEW BY JUDGES. JUDGES ARE SELECTED FROM THE ARTS COMMUNITY AND MEMBERS OF THE ARTS COUNCIL. THE AWARD CERTIFICATES ARE PRESENTED AT EACH HIGH SCHOOL’S ANNUAL AWARDS CEREMONY. THE RECIPIENTS ARE ALSO INVITED TO ATTEND ACT’S ANNUAL MEETING LUNCHEON (AS OUR GUESTS) WHERE MEMBERS HAVE AN OPPORTUNITY TO MEET THE STUDENTS, HEAR AND SEE THEIR TALENTS, AND LEARN MORE ABOUT THEIR FUTURE PLANS. THIS PROGRAM HAS MADE A DEFINITE POSITIVE IMPACT ON THE TORRANCE COMMUNITY.